The lower section of the Mohican River wasn’t always pristine. These days, the stretch near Loudonville is bustling with commercial activity — primarily tourism — but Brinkhaven and Cavallo along the southern part of the river were once thriving commercial centers. Progress and the 1913 flood changed all that. 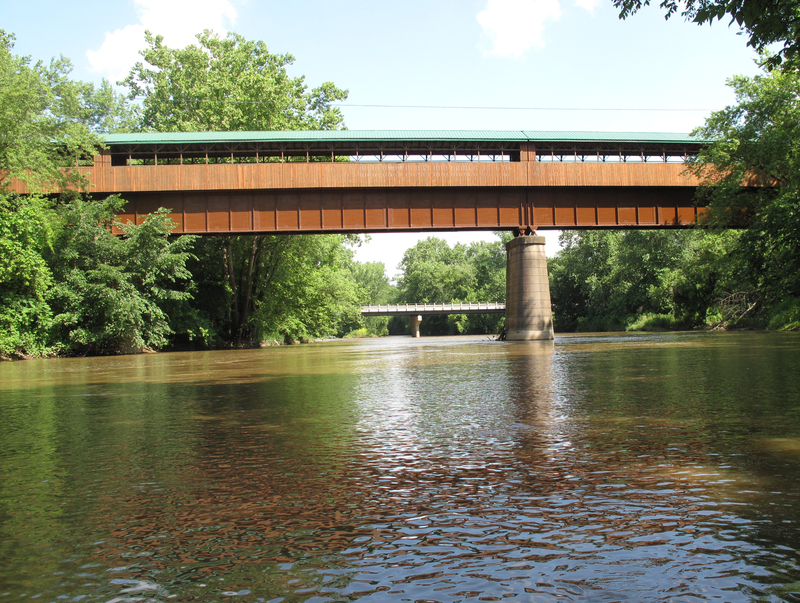 For this week’s article on the forks and other less-traveled sections of the Mohican River, we’ll explore the 18-mile stretch between Brinkhaven and Mohawk Dam. This is the most pristine section of the river, densely forested, nestled in a gradually widening valley and teeming with wildlife. In early June, I spent four days paddling from Mohicanville Dam on Lake Fork of the Mohican River to Mohawk Dam. 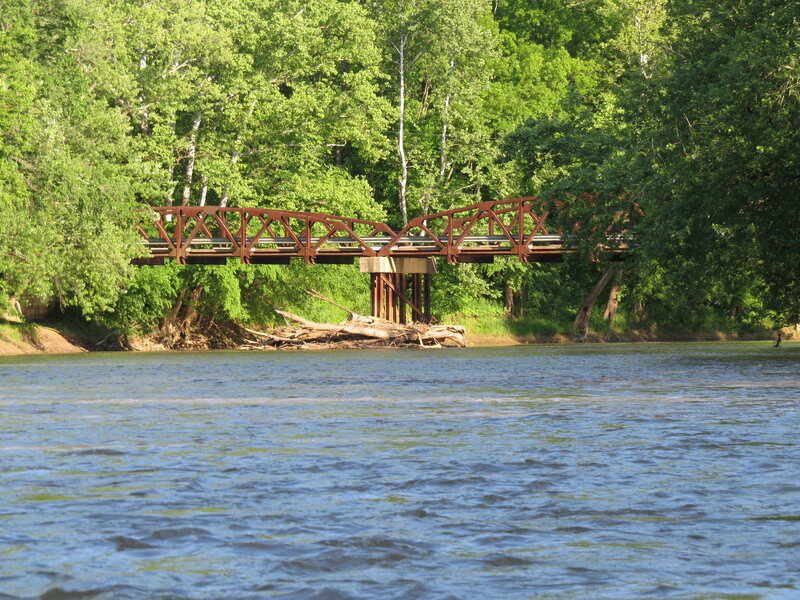 (The latter is on the Walhonding River, which originates at the confluence of the Mohican and Kokosing rivers.) For part of the trip, my friends Kevin and Theresa Clark of rural Loudonville joined me, putting on at Mohican Wilderness Campground and taking out at Cavallo. It had been an uneventful trip until Kevin’s kayak was swept into a log pile and capsized 2 ½ miles upstream of Brinkhaven. He survived the ordeal unscathed, but minus his glasses. Theresa and I reunited Kevin with has kayak, continued downstream and made it safely past Brinkhaven Dam. Over the years, Brinkhaven Dam has claimed its share of lives. I’ve been told eight people drowned there one summer alone. In the late 1970s, a section on the right side was chiseled out with jackhammers, making for relatively safe passage. Brinkhaven — also called Gann — once had a population of more than 1,000 souls, two railroads, a gristmill and a woolen mill. The 1913 flood wiped out the woolen mill. The gristmill structure survived the flood, but burned down in 1951. After clearing the dam, Kevin, Theresa and I stopped for a snack at the Bridge of Dreams, a former railroad trestle converted into Ohio’s longest covered bridge. It now serves as a river crossing for bicycles, hikers and Amish buggies. As we continued downstream, I pointed out islands along the way, islands my friends and I have named according to certain characteristics or incidents that occurred there over the years. Not all of the names are fit to print in a family newspaper. We saw a few bald eagles and happened on a fawn swimming along the east bank. Hard to say what had rousted it. 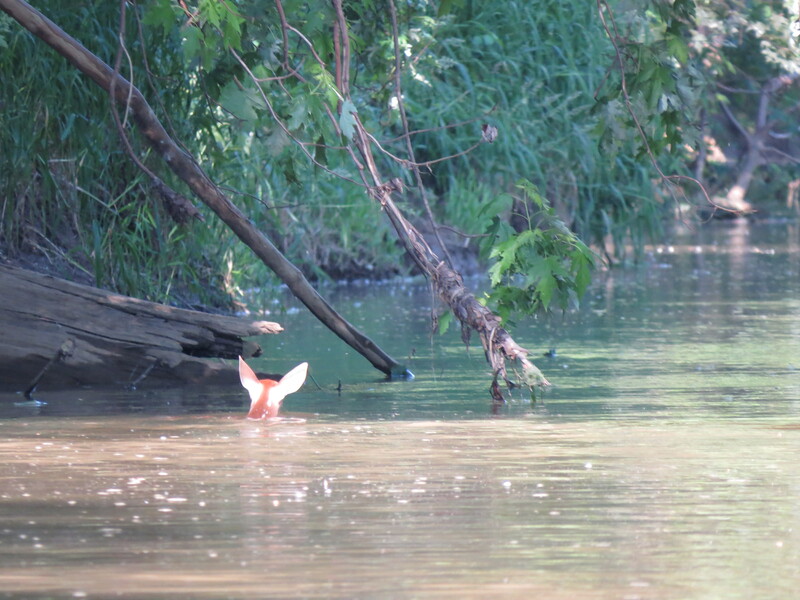 Perhaps the fawn heard us approaching, panicked and jumped into the river. The fawn managed to make its way back onto the bank. At Cavallo, Kevin, Theresa and I parted company and I continued to my campsite just downstream. Only a few houses remain in Cavallo. While the railroad brought prosperity to some regions, it eventually led to a decline for Cavallo. It had been the northern terminus of the Walhonding Canal and reportedly was a jumping little town. There were plans to continue canal north to Brinkhaven, but the Walhonding Valley Railroad rendered it obsolete and the canal was abandoned in 1896. 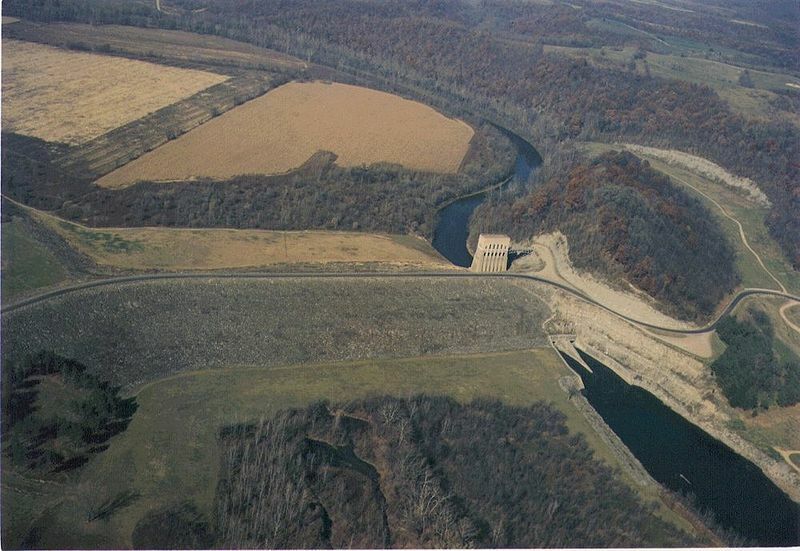 In turn, the construction of Mohawk Dam in the mid 1930s, severed the railroad connection between Coshocton to Loudonville. During World War II, the tracks were torn out and the iron used for the war effort. What remains of the canal trench can be seen along Township Road 368 in northeast Coshocton County. The ruins of a lock are located on the eastern end of the Village of Walhonding. I camped at Cavallo Island, not its official name but my name for it. To me, an island is a living thing. An island is born when the current carves out a channel and separates it from the mainland. It continually changes shape and position as the current undercuts parts of the bank or when sediment builds up behind debris that washes up on the island and behind trees that fall along its banks. In my 34 years on the river, I’ve seen a few islands come and go. On this trip, I was surprised to find that Cavallo Island was whole again. For decades, it had been broken up into three sections. Sediment has filled in the channels that separated the segments. I spent a peaceful evening in front of the campfire, watching daylight slowly fade through the tree canopy above, one of the things I love about summer camping. I also enjoy waking up while the darkness gradually steals away and I can see just well enough to dig out my camp stove and make a pot of coffee. I never grow tired of sitting back with a warm cup of coffee, listening to the birds sing and watching wisps of mist swirl up from the surface of the river. As I sat there eating breakfast, a bald eagle glided over the water at eye level. On this part of the Mohican River, there is an abundance of eagles, osprey, belted kingfishers, cedar waxwings, great blue heron and waterfowl. 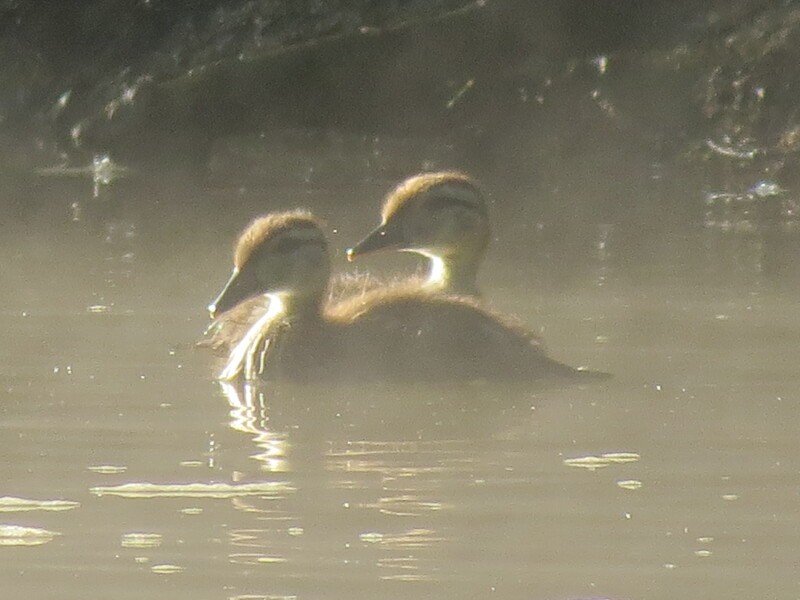 Later in the morning, I photographed a family of wood ducks swimming in the morning mist just downstream from my campsite. After breakfast, I grabbed my GPS and hiked the perimeter of the island. I’d estimated the island to be 10 acres and wasn’t far off; it measured 9.29 acres. With only 12 miles of river between Cavallo Island and Mohawk Dam, I had plenty of time to enjoy the day. It was warm and pleasant with no prospect for rain. In recent years, I’ve gotten in the habit of packing a weather radio. Knowing what kind of weather to expect helps in planning your day or adjusting your itinerary. I stopped for a cookout just past the confluence, where the Mohican and Kokosing rivers meet to form the Walhonding. I grilled what was left of my brats and sausage, ate a few and put the rest back into the cooler. I like having leftovers to eat at home after a canoe trip. Nothing like a good snack that allows you to savor memories of time spent on the river. This spot has become one of my favorite places on the Walhonding River for cookouts. I call it “the wash” because it’s located at the outlet of a swale that splits a steep hillside. There are plenty of fossils to pick through while waiting for lunch to cook. This is a part of the landscape where glaciers piled up debris before retreating and leaving behind reconfigured river valleys. I camped at this spot one cold and wet New Year’s Eve. As I ate breakfast the following morning, two kayaks and a canoe passed my campsite. Yet, here it was a warm sunny day in June, and I hadn’t seen another paddler on the river the whole time. From the confluence to Mohawk Dam, the river takes on a different personality. It meanders across a floodplain through a wide sprawling valley. The water is clearer, more like the Kokosing, which has a sand and gravel bottom. Consequently, the bass fishing is good. It once was on the Mohican, but siltation caused by poor land management practices has taken its toll on the bass population. Mohawk Dam rises from the floodplain like a monolith in the middle of nowhere. By late afternoon, Mohawk Dam came into sight. The gatehouse rises out of the vast floodplain like a monolith — with Art Deco undertones. Completed in 1937, this tall brick structure is an impressive sight. The earthen dam, which is not quite as high as the gatehouse, rises more than 100 feet above the valley. For those paddling beyond Mohawk Dam, I wouldn’t recommend portaging it. The preferred method is to find someone with a pickup truck at the campground on the other side of the dam and offer them a few bucks to haul your boat and gear over. Now that the statute of limitations has expired, I will tell you that I have paddled through the dam on occasion.